Going for a vacation is fun. But packing our luggage is tough. Most of us wish to keep it light without packing less. That’s why we bring you the list of top 10 best lightweight luggage for international travel. Well, There are numerous out there, some are good while some might not be able to meet your need. Which one must you choose? Check our list of 10 best and figure out one for you with ease! With airlines becoming strict charging for extra luggage weight it has become essential for us to switch to lightweight luggage option. The best thing about lightweight luggage is that you don’t have to leave your favorite stuff unpacked due to fear of extra costing. You can pack all your belongings in an organized manner as the lightweight luggage don’t add much to the weight. Moreover, they are sturdy, easy to handle and glide along airport without any inconvenience. They offer a stress-free space for all your stuff. Seeing That, The luggage itself can weigh 10 pounds or even more, therefore you either have to switch to one more luggage or limit the numbers of items. But the lightweight luggage is just perfect for international travels. They not just withstand the wear and tear but also offer spacious solutions to your international tour. So, Here are the top 10 best lightweight luggage for international travel reviews that you must definitely check before going for your next international tour! This is one of the finest lightweight luggage that top our list. It not only well-built but is also very spacious and large as compared to other types available. Also, It weighs 7.7 pounds and incorporates spinner wheels for easy gliding. It comes with a retractable handle that makes its handling effortless. There are also small pockets designed in the front offering storage space for quick need items. Despite being lightweight it is sturdy and can withstand all wear and tear for years. With its super lightweight, you can now pack more travel stuff without experiencing any over-weight restrictions. The spacious interior is compartmentalized with elastic shoe pockets and mesh pockets for undergarments. It is available only in 3 color options. The exterior look is simple and might not be attractive at the first sight. Just as its name suggests, this is the most lightweight luggage in the world, which the company claims. With a size of 28.9 inches and weight of only 4.9 pounds, it comes with amazing features. It is hard to believe but yes this is true! It is available in various color options, and hence, surely you would get your preferred color choice. The footrest at the bottom makes it a complete comfort while you need to wait in long queue lines. While the interior is well-spacious, even the exterior houses two pockets at the front that is large enough to pack lots of stuff. There is an additional side handle that allows comfortable grabbing, particularly when you are in the rush. The interior lid comes with mesh compartment to keep small stuff. With interior straps, you will be able to keep your stuff in place. The big size offers spacious storage option. The side and top handle makes it easy to hold and carry. There is an exclusive handlebar provided at the top that makes pushing and carrying it around pretty convenient. It is the world’s lightest weight luggage allowing you more space and weight to pack your stuff. It comes with a convenient footrest. It lacks spinning wheels, which can make it tough to handle especially in crowd. There are no exclusive sections inside to pack small stuff. This lightweight luggage is an ideal choice for those who have a preference for professional looking, high-end designs. With a chic denim design, this luggage is sleek, stylish, and one of the classy options available. It measures just 25 inches and incorporates an inbuilt wheel that spins 360 degrees and is absolutely comfortable. The retractable handle and spinning wheels make it easy to handle and carry around. 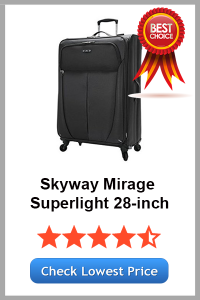 One distinguishing feature of this suitcase is that it alarms you when your luggage weight reaches 50 pounds. There are two lids inside two pouches of different sizes with the chain lock to seal in your stuff. With interior compartments, it is possible to keep your stuff securely in place. It is spacious and comes with spinning wheel. The chain lock pockets keep things secured and organized. It comes with a retractable handle. There are pouches of different sizes. It holds a spacious interior. The exterior surface is done with cloth that does not deliver lasting performance. While the weight of this luggage is 7.7 pounds, it might appear a little heavier, but actually is not. There is only one big compartment in the interior space and no sections for organized packing. 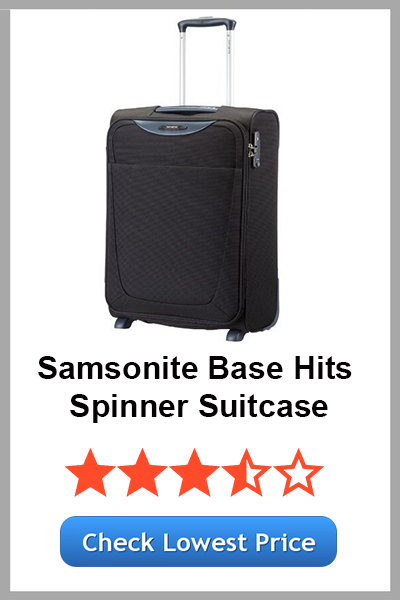 The Samsonite Base Hits Spinner 77/28 is a flexible and robust solution perfect for frequent travelers. It comes from the spinner range and hence convenience is guaranteed. The huge size offers ample amount of space and offers a storage capacity of up to 104 liters. With dimensions of 11 x 45 x 32cms, the luggage comes with 4 spinner wheels that make it absolutely maneuverable and easy to move and glide. There is also a retractable handle that allows convenient carrying and lifting. Since it is lightweight so even if you pack more still it will not add any weight of its own. Surprisingly, The added bonus of this luggage is its zip pouches that offer easy access. The telescopic handle and TSA lock make this one of the finest luggage to keep items secured even for long distances. The spinner wheels allow easy gliding and movement. TSA lock and front storage compartment offer safe and convenient storage of all types of stuff. For color lovers, it is available in various colors. It comes in a big, huge size. The exterior design is simple. The exterior shell is soft. You must avoid stuffing the luggage with too many items as it can hamper its shape. It lacks a retractable handle, which most of you would want. This is a hard shell suitcase is another premium lightweight checked luggage ideal for international travel. It is most durable luggage and offers lasting protection to your items and even lasting durability. 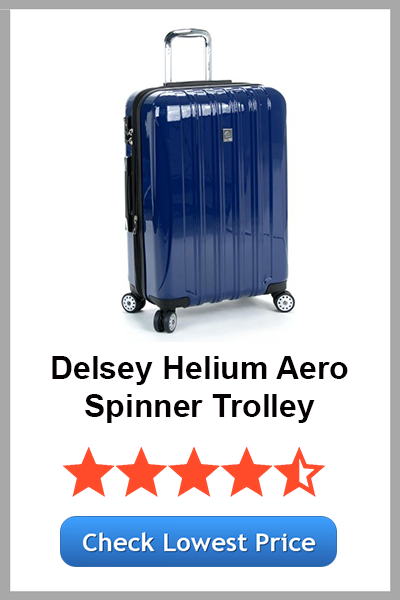 Delsey is also one of the best suitcase brands in the world. This compact size bag is excellent for international travels. It incorporates numerous great features that make it one of the best choices among the masses. While the body of this bag is lightweight the external of the bag houses 4-spinner wheels. It comes with a TSA certified digit lock. The external structure ensures that you experience no stress on your arms or shoulders. It is prepared with a polycarbonate material that offers lasting strength and hard wearing to the luggage. It comes with durable, hard shell technology. It offers stress-free and smooth movement. The spinner wheels make handling easy and convenient. It holds scratch free external surface. The interior includes straps and pockets to allow convenient packing. It offers mid-size packaging and the interior is simple. The weight is extremely light and might not be suitable for long distances. The size is compact, which may not serve the need of you are planning a too long travel. It is one of the all-time favorite lightweight luggage of the masses. It is one of the best cases to carry when you are moving to international destinations. Still, it holds a sleek and compact design that makes it stress-free to take along. There are multiple internal zips in the pocket with lid and spacious pockets on each side that offer additional storage space for different small items. The bag glides smoothly and does not incur stress even on uneven surfaces and rarely interrupts even moving on the rough terrain. It comes with a ‘honeycomb’ design that makes it even lighter. There is also added firmness for side protection. Hence, even if you are moving distances and rough handling this case then it will be your best companion. It is a compact and sleek shape offering spacious room for items. The side pockets with zips allow convenient storing of small items. Spinner wheels and side handles offer easy gliding and grabbing of the bag. The big size of the bag offers enough room to pack almost everything that you would want to carry. The bag slides smoothly on rough surfaces. The handle adjusts to up to 42.5 inches, which makes it a better option for taller people. You may not be able to carry heavy stuff in the luggage. There are no different pockets in the inside. 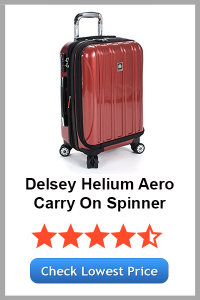 If you are looking for certain specific criterions in a lightweight Spinner Carry On luggage then the Desley Luggage Helium Aero is the perfect solution for you. With this in mind, The most amazing aspect of this case is that despite the huge size it is light in weight. The bag is just 9.5lbs, which makes it a light luggage to carry. 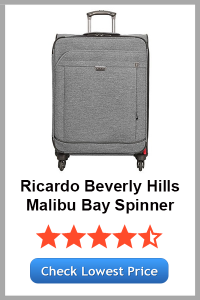 It comes with 4-point spinner wheels that make it a seamless and convenient option to carry. To Point out, The luggage comes with a hard shell case prepared from lightweight and strong polycarbonate. As a result, all you get is additional and amazing durability making your stuff feel more secured. Not to Mention, Another amazing aspect of this suitcase is that it is expandable. Also, the TSA certified locking mechanism offers an additional feature on the cabin luggage. If we look at the interior then it comes with zipper pockets as well as straps to keep things organized and secured. The interior pockets offer organized space for storage. The bag is expandable offering additional space for packing items. It is among the lightest luggage for international travels. It comes with a robust, hard shell case. The size is big, still, weight is less. The bag does not hold much resistance to scratches. The design is simple and may not impress the modern travelers. You may not prefer it if you are traveling with small kids. 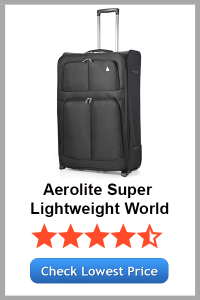 The best thing about the aerolite super lightweight world is that it offers enough space for your stuff and still does not add much to the weight. It offers freedom from the weight restrictions set by numerous airlines and is an ideal choice for all kinds of travels. It comes with a 68-liter storage capacity having numerous additional the compartments for storing different items in a well-organized manner. Equally Important, The suitcase has dimensions of 65 x 41 x 25cms making it a decent size luggage for the variety of travels and situations. It adheres to the airlines' weight restrictions and is one of the lightest cases around. It gives an unpacked ultra lightweight of just 2.4kgs and hence there must not be any problem while lifting the case to an airplane cabin. The suitcase holds different sections to pack things in an organized manner. Easy handling and movement with spinner wheels and telescopic handle. It suitcase comes with 2 wheels and one telescopic handle offering convenient movement to spaces. It holds a decent design. The interior design lacks zipper pouches and straps lacking additional security to the stuff. There are limited color options available. 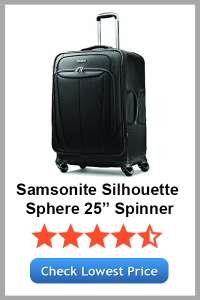 The Samsonite Luggage Silhouette Sphere is another fantastic bag on our list. 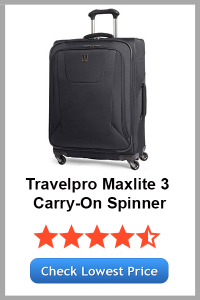 It is a one of the best 25-inch Spinner luggage prepared with soft case shell that is prepared of solid and sturdy nylon featuring 4 spinner wheels that move flawlessly and eradicate the strains imprinted by other bags on the back or shoulder. It is the lightest to carry and comes with a robust retractable handle delivering a gel push button. The handle is ideal for most of the masses, but those with taller height may experience the certain problem. The interior comes with discreet pockets as well as tri-fold zippers that are removable and can bag huge stuff at a time. 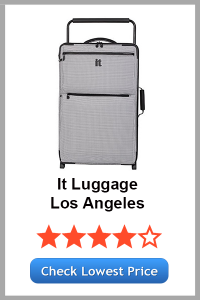 Uniquely, The best aspect of this suitcase is that it holds excellent resistance to water. Another fantastic aspect of this bag is that it comes with handles on the bottom as well as on the sides for convenient lifting of the bags. It is one of the finest lightweight bags to pick. The tri-fold zipper offers additional space for storage. The bag comes with a retractable handle and a gel button that makes it an adequate choice for most of the people. There are numerous discreet pockets inside that offer enough space for small and medium stuff. The fabric may not be able to withstand much wear and tear. The luggage may not be able to deliver similar performance on rough terrains. May not fit your long distance travel needs. 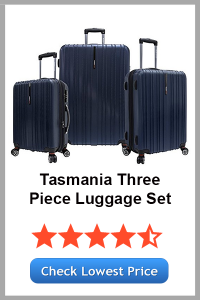 Last but not the least on our list of top 10 lightweight luggage is one of the hot sellers among the travelers, Tasmania Three-Piece Luggage Set. It is prepared with 100% polycarbonate and is an excellent choice for busy travelers who prefer rough and tough handling. The bag comes with double spinner wheels that offer quiet and smooth rolling even on uneven surfaces. In Addition, The bag incorporates an expansion gusset offering 25% more packing space. The spacious interior comes with mesh pockets as well as center zip pouch that allow convenient and well-organized packing of all the stuff. It offers excellent storage space at affordability. It comes with a hard shell that offers additional security to the items. It comes with side carry handles that enhances convenience. It is available with TSA certified 3-dial lock mechanism for absolute security. It holds a bag strap for additional storing. The case is available in just 3 colors. The exterior and interior designs are simple as compared to other lightweight luggage. The design does not hold resistance to water or scratches. There are two types of shell case available – the soft case and hard case. When buying lightweight cases it is essential to check for their shell’s strength. The sacrifice of weight must not be accompanied with cheap quality. However, Whether it is a lightweight luggage or a cabin bag, just check it in order to identify the strength of the luggage. Some of the common cases that several brand uses are nylon cases, hard-polycarbonate cases, soft polyester cases, and more. Soft cases hold excellent resistance to scratch but are not waterproof while hard cases are waterproof. With interior compartments in a luggage, it becomes easy to pack items and keep things organized. Most of the hard case suitcases allow you to pack your luggage from both sides. They even include zippered pockets and straps offering additional space for your stuff. Some soft cases are also good but they usually lack flexibility. Well, There might be some trips where you need to carry more items. So, make sure you pick a luggage that offers you convenient expandability. You must be able to increase or decrease storage space as per your need to offer secured packing of your items. We hope this guide has been helpful to you and can help you choose the best lightweight luggage for yourself to own ease and convenience for all your international travels. If still have any confusions then just pick any of the above top ten and surely you will have a great packing and traveling experience.